Trebbiano is "a grape variety that probably makes more white wine in the world than any other. It gives good yields, but makes undistinguished wine at best." Except in cases like this. Lilla is a delicious low priced Trebbiano d' Abruzzo bottled by San Lorenzo Vini and imported by H.Squared Wines. Found it at Home Liquors in Verona for just $4.99. Wow. On South Fullerton, Bistro 18 has opened. My friend Ann Goldstein whose opinion I trust gave it a thumbs up. "We tried Bistro 18 last night. I’d go again, maybe not Sat. night. They seem to run a tight ship." Others posting in Baristanet say yes. Guess I will have to give it a try. What wine would you crave if you were castaway on a dessert Island? What wine book would you desire? 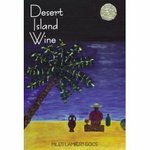 You might choose Dessert Island Wine where author Miles Lambert-Gocs pokes serious fun at the often pretentious world of wine and enlightens us to its many wonders. Serious because each of the 29 articles in this well written book contain substantial thought on their topic, yet all have the twist of light hearted humor which makes them fun to read. A Bloody Mary can be a great party drink. You can doll it up in many ways. Here are some of my favorite variations. Remember to adjust the alcohol content to suit your guests taste and driving plans. Broad Street in Bloomfield between Warren and Waverly is becoming quite the restuarant row. With Pandan, Momoya, Brookside Thai and a new immediate favorite Bohemia. I should not leave off the list old favorites like Vinnie's, Town Pub and Obels Inn. This review is about Bohemia, where we dined last night with our fellow fussy foody friends Gail and Marc. We all left very happy and anxious to return. A few months ago, Kings began offering these exotic gourmet salts. Priced at 9 to 12 dollars for a 4.4 ounce jar they seemed like a real luxury. I was very intrigued but the price point did not appeal to me. I am particular about salt, we have no Morton Salt in our kitchen, Diamond Kosher or Sea Salt Crystals in the ready to use grinders is preferred. Yet I asked myself can salt really be worth what amounts to $20 to $50 a pound? Morton is less than a buck, 26 oz for 60 cents, Diamond Kosher is 1.89 for 40 oz, the Sea Salt complete with grinder is a whopping 2.49 for 2.5 oz. They went on a sale and on a lark I bought one, now we are hooked. They are that good.